Say hello to Merlin Project 5! The next generation of Merlin Project app is here. 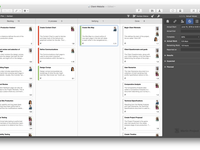 With kanban boards, groupings, resource pool, mind maps & much more we define with this version again the standard for project management software on the Mac. Merlin Project Reviews Recently Reviewed! 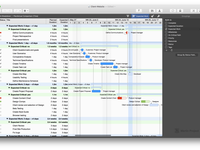 Pros: Merlin Project allows you to either type in your project's phases or drag-n-draw them directly on the Gantt chart. This way, you'll have a good overview within moments. 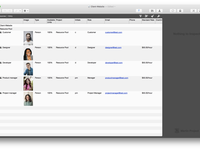 The Resources are nicely integrated into the project, leading to a very usable Assignments view to check critical days. I mostly use the export as an image, that produces a PDF vector image. Very good quality! In my next project planning, I seek to explore the Library. Looks like a powerful feature. - clicking at the Resources button at the top right of the toolbar merely shows a list of resources. If you want more (like editing them), you have to click at the top left in the Views list. - the Inspector is quite hard to figure out. I find myself browsing through it almost constantly searching for that one setting. Everything seems to be pushed into this small area, including things that, in my opinion, could have been part of the app's Preferences pane. Merlin Project introduced some very dark gray areas in the interface (the Inspector part) that I'm not so fond of. Perhaps there could be a choice between a dark and a light interface. Overall: Overall, Merlin Project is a very user friendly software. To me, it feels like I'm sketching out a project planning rather than calculating it. As a result, I can focus almost all of my attention to the planning itself - instead of figuring out the Gantt chart setup..
thank you for your review. We appreciate it. The resources well is for fast creating resources and add them to the project. All information which should be more in details are in the views, so is the resources view, the utilization view etc. 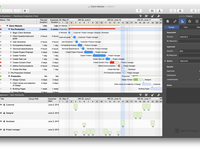 In Merlin Project you find a new and better project preferences settings Inspector. Pros: I like the flexibility, the ease of use and the beauty of any output. These guys really care for high quality software. Cons: The iOS app is optimized for iPhone and therefore not perfect on iPad. But if you use the side-multitasking-mode (whatever this called) you emulate an iPhone on the iPad and then it works fine. Overall: I started using Merlin 3 some months ago and was eagerly waiting for the sync between projects on Mac and iPhone. Since two weeks the beta of Merlin Project 4 is available and they really nailed it. 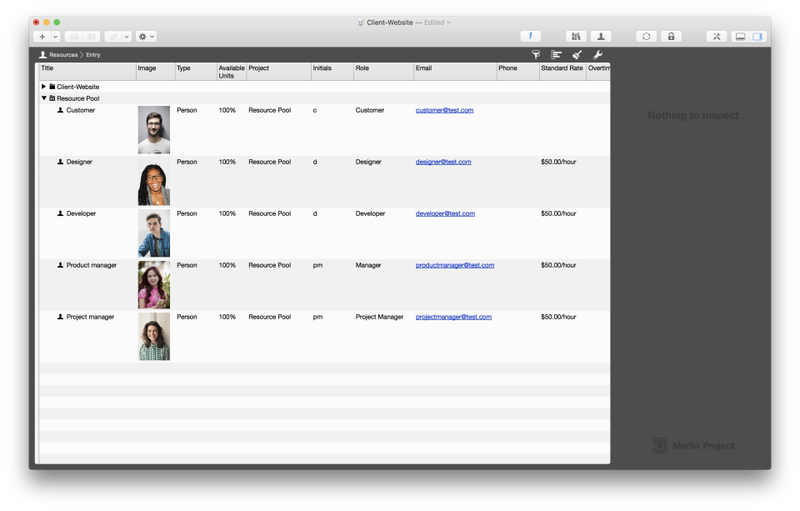 Now you have the power of one of the best PM apps on Mac (if not _the_ best) and a nice little iPhone app. I completely switched to that solution. I'll checked as well the support and they replied super fast and very helpful. Recommendations to other buyers: I dropped all other pm solutions and exclusively go with Merlin Project. With the Merlin Server I have my coworkers on Windows using the ready and read-only plan in a browser. Pros: This application is extremely customizable and very easy to use. It offers multiple ways to track job related tasks and budgets. The application is greatly suited for making schedule changes on the fly and updates entire project when changes are made. Cons: I wish I could come up with a better Con, than this, but here goes... Why is this available only for Apple systems? IF this application were cross platform, or independent of operating system it would be able to compete with some of the best out there. Overall: I used this program to handle scheduling multiple construction crews across multiple regions in the country and found that it was very simplistic and powerful. Helped me track Macro budgets and was key in helping determine how to assign the proper labor to the right project. 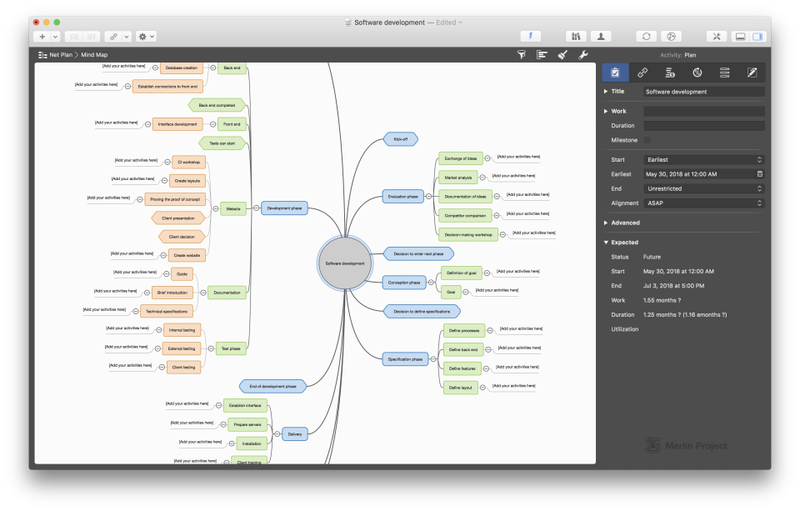 Pros: This is the only software I have found that allows the user to go from a mind map to gantt. This was my bare minimum requirement because this aligns perfectly to my project workflow. Cons: It is very functional and thus can get a bit complex and overwhelming from time to time. Overall: For our business, as a consulting firm, we depend on Merlin Project and we are happy with our choice in PM software, considering that we have a wealth of options out there. Cons: I don´t know exactly - and i don´t want to search for something! Overall: Very usefull and cheap, all good ! Pros: I believe that Merlin is the best project management software available today. It has a very clean and intuitive interface but it is also very feature rich. We have been so impressed with its performance that not only do we use it but we also offer Merlin training and consulting in North America. Cons: Merlin does not run on the Windows platform. Users in a Windows or mixed environment can, however, purchase the Merlin server edition which publishes project information in an html format. In this sense it is cross platform. Overall: Since Merlin reads and writes MS Project files, I think it is a viable alternative for almost any project manager for almost any project. 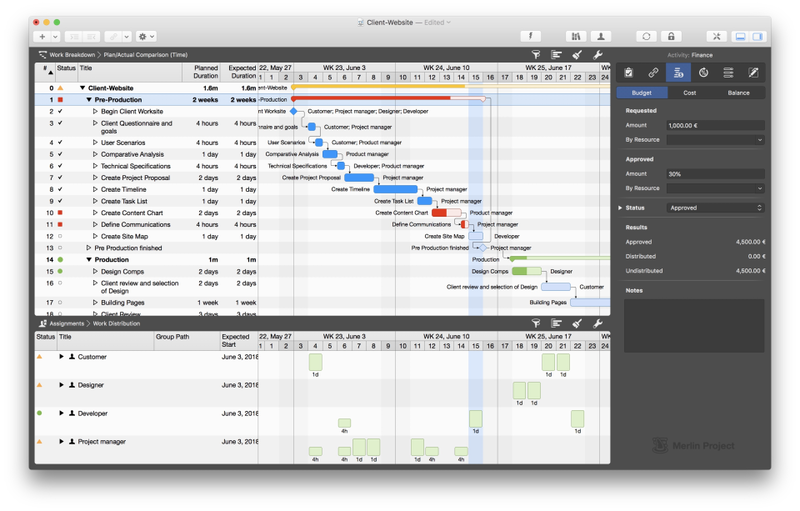 The best project management software for my mobile work style. Pros: The best part about this software is being able to create charts and graphs to print and show to clients. Cons: I loved Merlin Project and would use it again any time! Comments: It has taken me literally 2 weeks to find a viable alternative to MS Project for a MAC. After extensively researching the more visible search results: Omniplan, Wrike, AtTask, Libreproject, Openproject, harvest, etc.. I finally found Merlin--exactly the same logic as MS Project, but with a new looking UI and powerful tracking capabilities for high-level task tracking with just the right details for time variance, budget vs. actual reporting, and resource capacity planning. I'm really looking forward to continuing to use this tool--especially since I just downloaded Merlin Project (beta version). Really awesome! 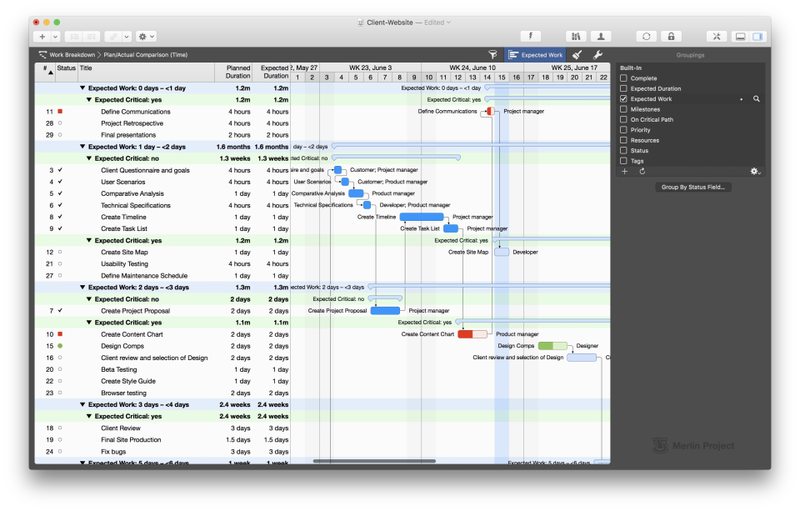 Comments: I searched a long time for a decent project management app on OS X und eventually I found Merlin Project. 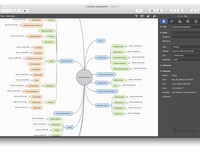 This is not only a pm app, it is also a mind mapping app, a reporting app and much more! All view are configurable in any detail. It offers the widest range of pm functions wich are needed and used in actual management. And if you have a question, you will get a world class support: fast and super good! Comments: Ever since I switched to Mac I was looking for a viable alternative for MS Project and I finally found it in Merlin Project. thank you for your review. Could you please tell us, what do you miss in "Ease of Use" and "Customer Support"